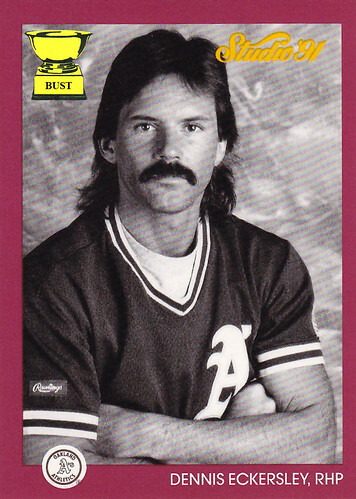 Dennis Eckersley's train of thought from 4:27 to 4:28 p.m., Feb. 17, 1991: "God, I hate Studio. It's bad enough they don't have any color film. Then they ask us ballplayers to do all these ridiculous things! Look, I'm not going to kiss a bat. I'm not going to laugh like an idiot. And I'm sure as hell not going to cup any balls. I'm just going to sit here with my arms crossed and look totally normal. (Pause) Ah crap, I forgot to wax my mullet!"